When glue tapes first came out in Singapore, I was really excited to get my hands on it. Being a rather crafty kid, I was always doing art projects and have usually found myself in a sticky situation (no pun intended). Thanks to the existence of glue tapes, my arts and crafts projects have been less messy and more precise. Although you may probably use glue tapes to stick two pieces of paper together, there are plenty of other functions a glue tape can fulfill as well. That is why I will be sharing with you four creative ways on how you can use glue tapes in the office. If you would like to find a way to jazz up those boring and out-dated looking labels, you can use a glue tape to customise and create beautiful labels! You will simply need to use paper, a glue tape, and some stationeries in order to create your very own unique labels. From pantry containers to document holders, you can label anything to your heart’s content. This is a good alternative to using tape dispensers that are bulky, heavy, and not as portable as glue tapes. 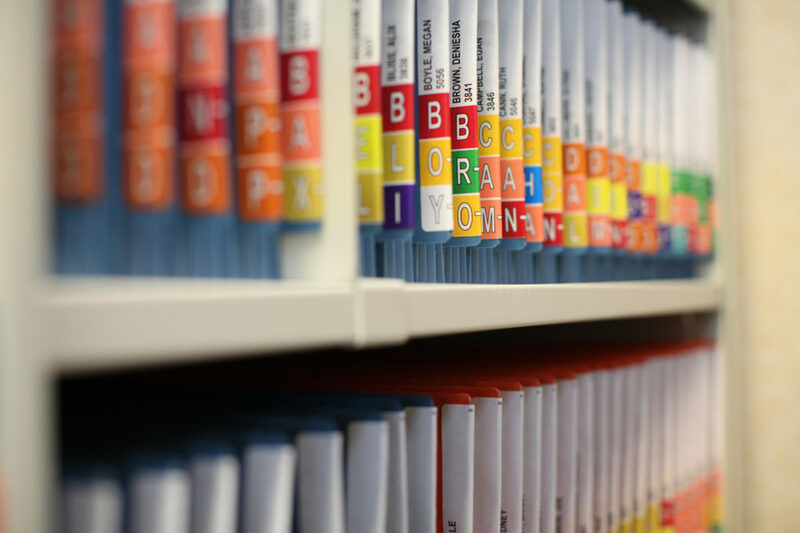 Another tip to help extend the longevity of your folders is to lay a strip of clear tape onto the folder tab before you apply your label. This way, when you would like to re-label your folder, you can simply tear off the clear tape. It is a quick and simple way of reorganising your folders without damaging the exterior. Using a glue tape would also be useful for you to sort your documents instead of using traditional tools such as staples and paper clips. Using staples allow for a simple way to bind papers together. However, the staple is visible (which can look aesthetically unappealing) and can be dangerous when the staple becomes loose. In addition, using paper clips will leave creases on the documents and the paper clips can unravel when not inserted properly. 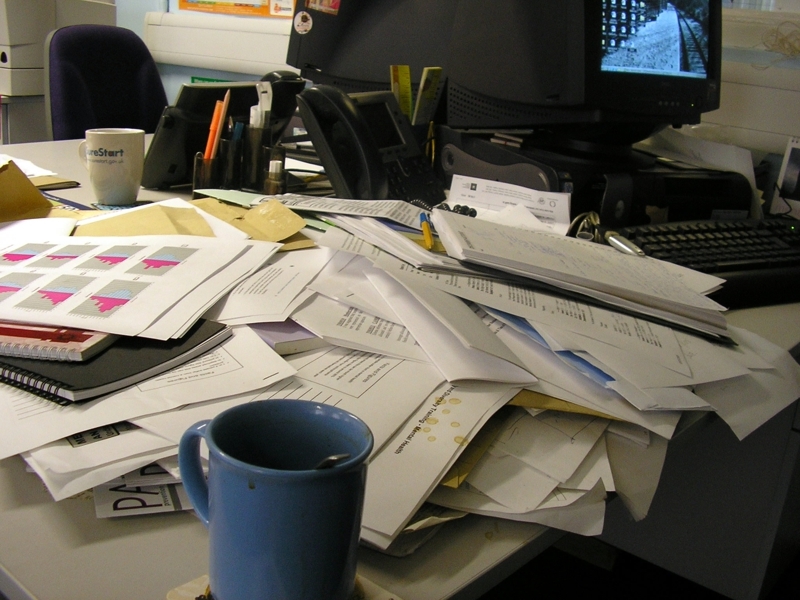 Moreover, paper clips only allow for a small paper capacity, so you will not be able to bind large stacks of paper together. Therefore, a good solution to these problems would be to use a glue tape to bind documents together. You can simply tape the papers together and it forms a bind that looks clean, undamaged, and creaseless. There have been so many incidents when I desperately needed a sticky note. Be it to note down tasks that I needed to complete, or to add further information about a topic to my notebook, it is an essential part of my life and perhaps, yours too. If you have faced similar incidents, do not worry because we’ve got your back. If you have pieces of paper lying around, use a glue tape, and simply run it over the top of the paper. This will create a pseudo-sticky note that you can use immediately. 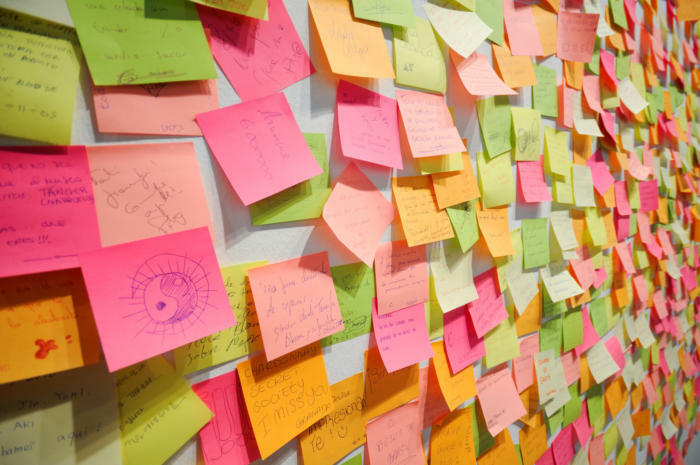 You can also use this trick to create customisable sticky notes to fit your requirements. According to an article by Entrepreneur, five minutes of creativity per day can actually help to boost your productivity. 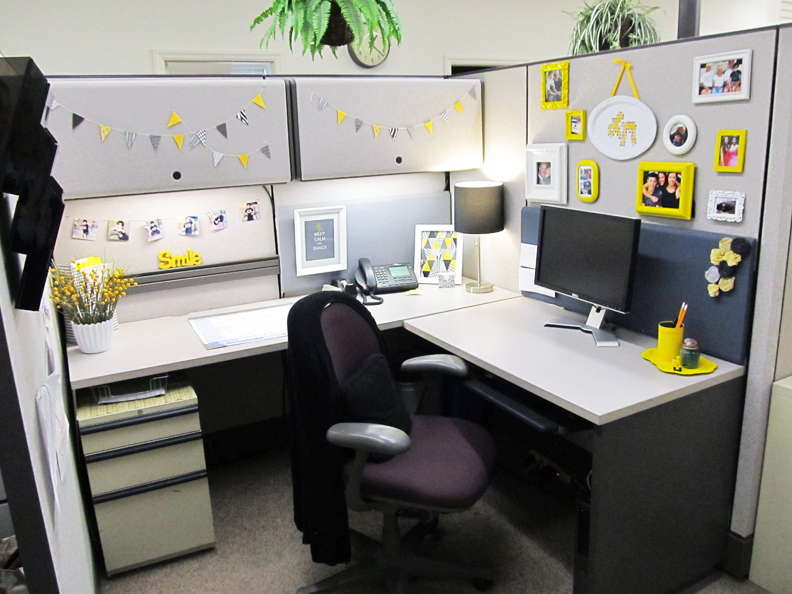 You can take this as an excuse to start a Do-It-Yourself (DIY) project to decorate your desk. From mood-boards to your very own desktop lantern, you can use glue tapes to help you accomplish these DIY projects. In comparison to conventional binding products such as liquid glue and double-sided tapes, the glue tape will be able to give you a more stress-free DIY experience. Liquid glue can be messy and smelly. Moreover, it can take up to hours for the glue to dry, making it hard to handle for some people. If you are not careful with the application of the glue, glue splotches will form, making it highly visible and visually unattractive. Although double-sided tapes provide slightly more convenience than liquid glue, it still comes with its disadvantages. Firstly, it takes a substantial amount of time to cut the tape and paste it on the desired area. Secondly, it is difficult to estimate the approximate tape length needed. Most of the time, you will probably cut a tape length that may be too long or short for the area. Lastly, removing the backing strip can be a hassle. Glue tapes are perfect and practical for gluing paper, cardboard, and pictures. It offers an ideal solution for precise gluing that is far beyond the capabilities of other glue products. 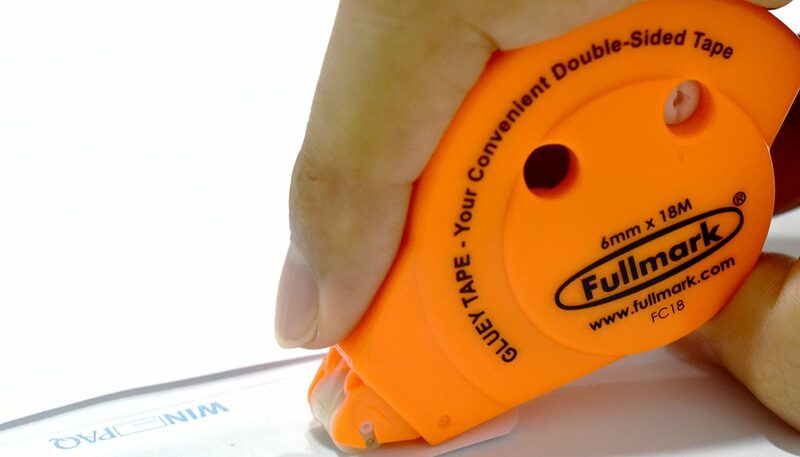 Fullmark has an extensive range of glue tapes fit for every application. 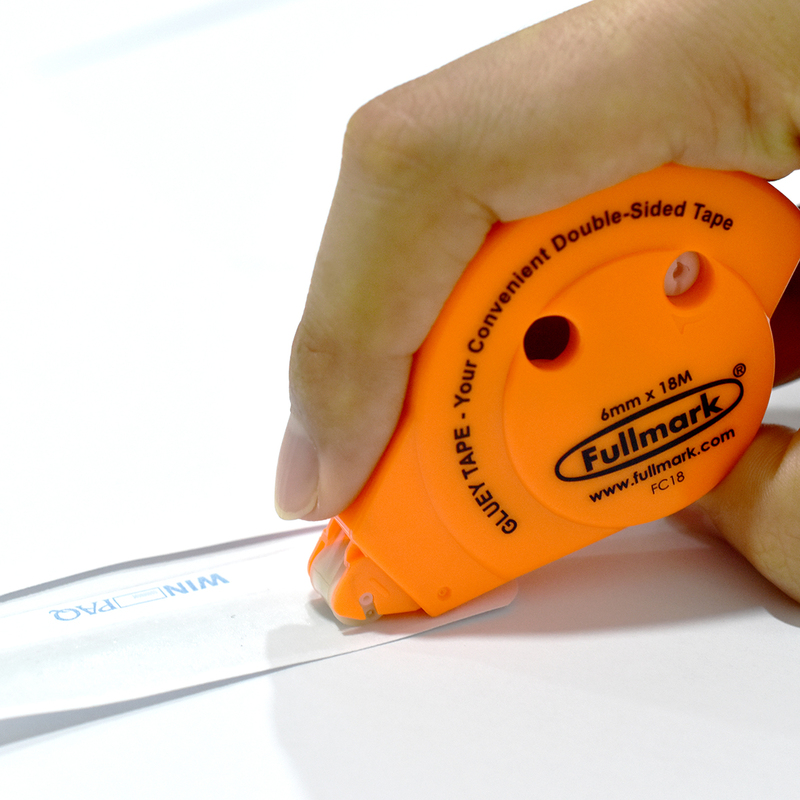 Fullmark’s Permanent Double Stick Adhesive Roller is not just odourless and mess-free, it is also pH neutral and safe to be used on photos without damaging them. Using belt-driven technology and a secure roller head, the glue tape is easy to use and provides a smooth and even application. Equipped with a polyester film base, it is assured to be of premium quality and will not tear easily. Here’s why you should have glue tapes stocked up in your office’s stationery stash. When you think of the word “glue”, you are probably thinking of the times when your fingers were sticky and precious clothes were ruined. Since glue tapes do not use fluid glue to bind objects together, you can say goodbye to these bad memories. The glue tapes offer a clean cut and smooth finish, without the hassle of a traditional liquid glue. 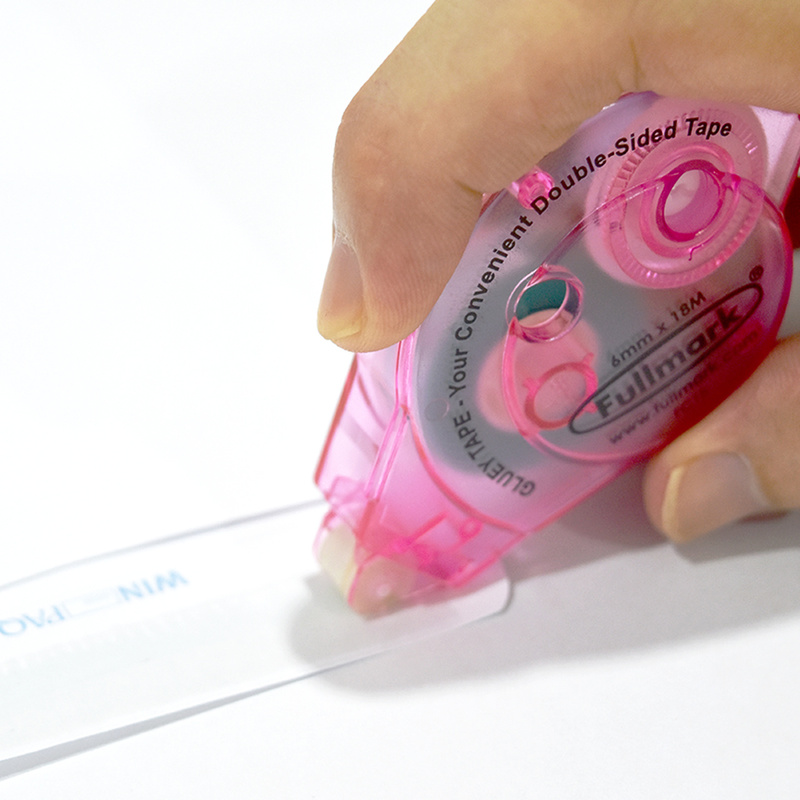 The glue tape rollers by Fullmark are ergonomically shaped, which makes it easy to use. Moreover, its handy and lightweight design makes it easy to hold. This also allows for the application of any length in just one seamless movement. The unique, pivoting head of the glue tape makes curves possible and very easy. The heads of glue tapes are able to dispense gently, smoothly and quickly for precise positioning every time. This allows for a highly meticulous application which has yet to be achieved by other conventional glue products. The dispenser is able to allow the glue to be applied accurately and carefully to avoid any mess and waste. We hope that this post has helped you to consider purchasing glue tapes or using glue tapes in a more creative way. If you have any other suggestions or comments, please feel free to leave it in the comments section down below.